What a wonderful piece of jewelry!!! This beautiful ring is crafted in 14k white gold and features an emerald cut solitaire emerald flanked on either side by two princess cut diamonds set in prongs settings & 6 round (brilliant) cut diamonds set in pave' setting. Total weight for the piece is 4.0 gr.. 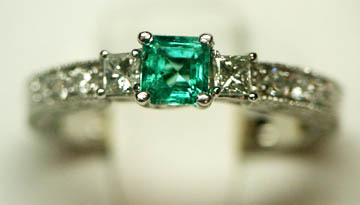 The emerald is an eye-catching & it is in high quality 0.40 ct and the diamonds total 0.38 ct. Origin of emerald is Columbia. The diamonds are G-H in color and clarity is SI1-SI2. 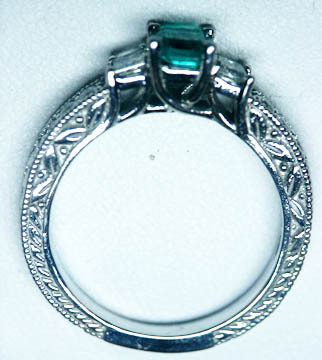 The ring is a ladies size 7, but can easily be resized at your request. Included in this price is OUR OWN appraisal for insurance purposes.